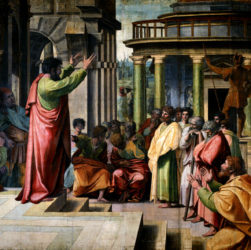 Christians believe that Paul of Tarsus is the ‘Apostle’ of Jesus(P), whom he met in a vision on his journey to Damascus. Paul is also claimed to be the author of the Epistles to the Romans, 1 and 2 Corinthians, Galatians, Ephesians, Philippians, Colossians, 1 and 2 Thessalonians, 1 and 2 Timothy, Titus, Philemon and Hebrews. It is therefore strange that this self-confessed ‘Apostle’ of Jesus Christ fails to pay more attention to the words of Jesus (P) himself in his epistles. To what extent has the Pauline letters shaped the selection of the gospels of the New Testament as canon today? This article will examine the evidence and present its conclusions on the matter, insha’allah.